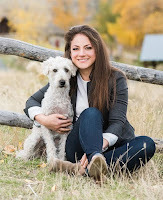 From Goodreads ~ When Rory Kress began to wonder where her beloved Wheaten Terrier, Izzie, had really come from, she had no idea of the horrors she would uncover. With stunning insight and tenacity, Kress launches an investigation into the harsh realities of the American dog-breeding industry, exposing troubling ties to factory farming and big agriculture. 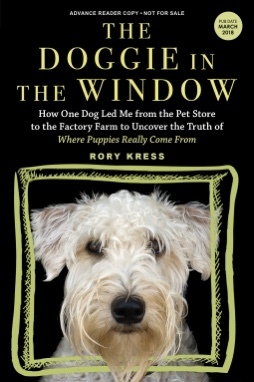 From a pet shop on Long Island to the puppy mills of rural Missouri, from the author’s own living room to a ride-along with a dog rescue organization, "The Doggie in the Window" is a must-read for all dog owners and a call to action for improving the lives of man’s best friend. I'm a dog lover and enjoy reading books about them. Rory Kress is a journalist. She and her boyfriend (now husband), Dan, had just moved in together and decided to get a dog. They went to what they thought was a reputable pet store and spontaneously bought a Wheaten Terrier which they named Izzie. Rory started to wonder about Izzie's background and that led her to start investigating the commercial dog-breeding industry in the United States and this book is the result. She did a massive amount of detailed investigation, speaking with government officials and undercover agents who went into puppy mills, visiting puppy mills, breeders and dog auctions, interviewing people who have bought puppies from pet stores and puppy mills, and more. She even had Izzie analyzed to see what effect being a puppy mill puppy had on her (it did). The book was hard at times to read given the treatment of the dogs. It's amazing that with all the regulations and laws in place that puppy mills still exist and breeding dogs are treated has horrific as they are. Yet with all this knowledge out there, buyer still turn a blind eye and buy dogs from pet stores or breeders without first checking out the conditions. Here in Toronto pet stores can't sell cats and dogs (yay!). They can, though, sponsor adopt a thons with animals from rescues. That's how we've gotten our cats.